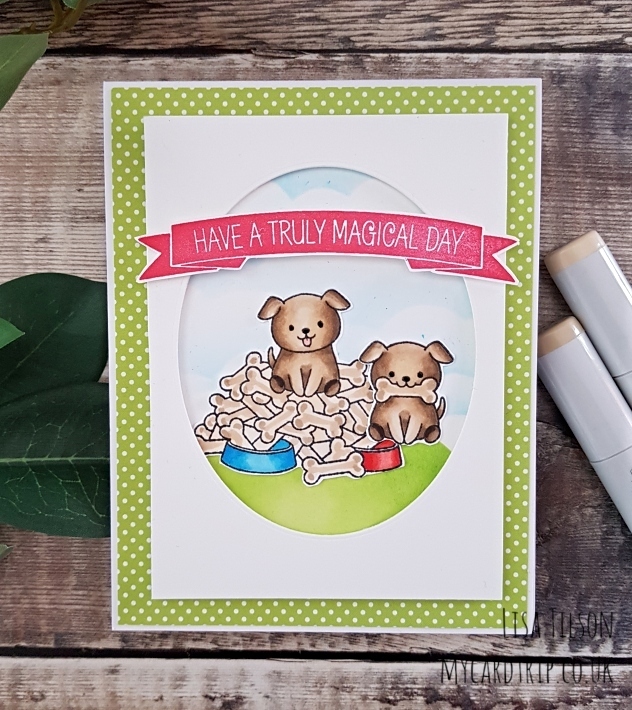 Welcome back for my final teaser card for the Clearly Besotted April release. Today’s card features a lovely set called My Favourite Food. It is one of the larger A6 sets and has some super sweet dog, monkey and mice images… along with bones, bananas and cheese oh my! Here is today’s card, and another outing for some patterned paper (insert halo here ha ha). This was a fairly quick card to put together. That is if you don’t go wrong and have to do it twice. On my first attempt, I had a different patterned paper around the edge of the frame which I didn’t like much and I also had a blended sky that I felt was too dark, so it got binned and this one was born! I took an A2 top folding Neenah base card, and adhered a panel of paper from MFT Candy Land with DST. I then took a panel of 110lb cardstock and one of the HA Nesting Oval Dies and ran it through the Big Shot. I put some foam tape on the back and set it to one side. Next I stamped the images onto Neenah 80lb, Copic coloured them and fussy cut them, but there are dies available. The main image is the dog sitting on the bones, but there is separate little dog with bone in mouth image which you can use as an addition to your scene, so I included him too. I added a little black glaze pen on their eyes to make them pop a bit more and some Tonic Nuvo Aqua shimmer on the bowls and bones. I then used one of the HA oval dies to create a mask. Above the mask I blended some Salty Ocean Oxide ink through the MFT Cloud stencil, below the mask was Mowed Lawn Oxide Ink. 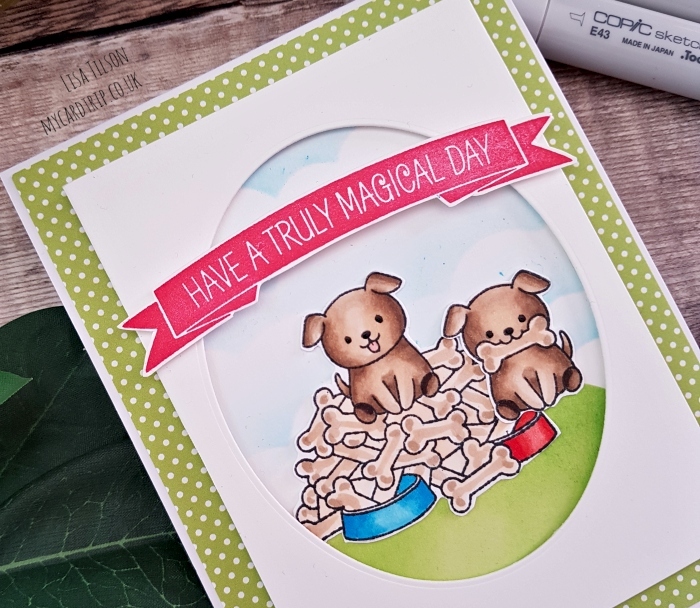 The dog images were adhered with wet adhesive onto the panel which was then added to the base card with double sided tape. To finish the card I popped the window panel on top and then stamped one of the banners from the new Say It With Banners set. Can you believe that I did not have a red ink in my stash?? Apart from a Distress Ink and they don’t stamp that well. And I desperately wanted red to tie in with the red bowl! But, I found an unused (!) Versacolor Pigment Ink called Camellia which, when stamped three times, came out almost red or at least close enough. Note to self, get a red ink! Although I have to say this is a very pretty ink and I must remember to use it again. The banner was trimmed and popped up across the top of the panel with foam tape. So there we go, today’s card finished and I did like the second attempt. There was almost a third attempt with the dogs popped up on foam tape, positioned higher in the frame, and the banner at the bottom, but I didn’t go there in the end! Thanks as always for visiting, hope you have a great day friends! 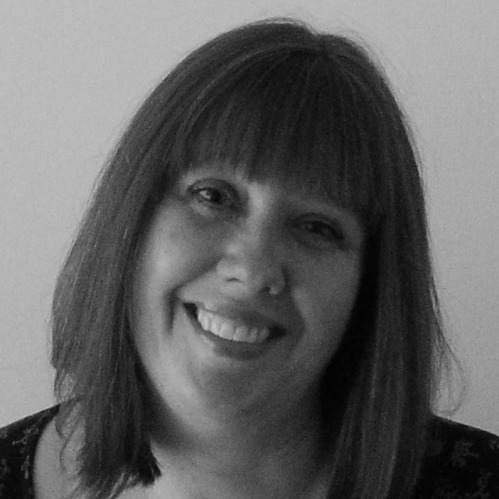 Don’t forget to pop over to Stephanie, Keren and Michelle to see their inspiration. I will have one last post for you tomorrow with will be a recap of my cards and links to all the new products. They go live at 8pm BST here in the UK at Clearly Besotted and over at Simon Says Stamp. i bet the other one was just as nice. we are our own worst critics. and our little Toby does this with his bones. He “buries” them in our sofa, under the blanket, then sit s on top of them like Smaug. Darling card! Love these cute pups!